WARNING! 3D greatly increases the cuteness of virtual puppies and kittens. Hands down, out of every game available at Nintendo's New York 3DS event, Nintendogs + Cats was the one that really proved to me that 3D can be more than a gimmick. It turns out that 3D makes cute puppies, and now kittens, even cuter. I literally emitted a huge "D'awwwww" when first picking up the game. 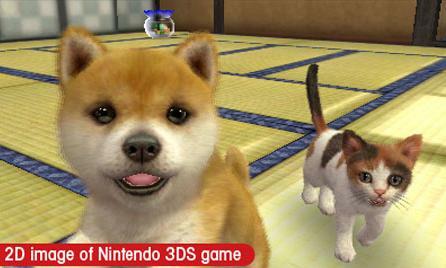 For those unaware, Nintendogs + Cats brings the formula of Nintendogs to the 3DS with the addition of felines. Unfortunately, the version that I played didn't show off many features and was still in Japanese, but cuteness is a universal language. Players still call their pets, play with them, and scratch their ears. In addition to a visual upgrade, it looks like the different behaviors of the pets have been made significantly more realistic. I watched a my French Bulldog gallivant around with a calico cat for a while just because it was so damn cute. When throwing a toy, such as a boomerang, the dog will chase it and the cat might try to get into the action or tease him and take it away. 20+ breeds of dogs have been added to Nintendogs + Cats, and Nintendo says they've implemented an increased number of body styles, leg lengths, and other factors for pets to grow into. Dogs and cats learn to know the faces of their owners via the 3DS camera, and might even be shy of new people stepping in front of it. 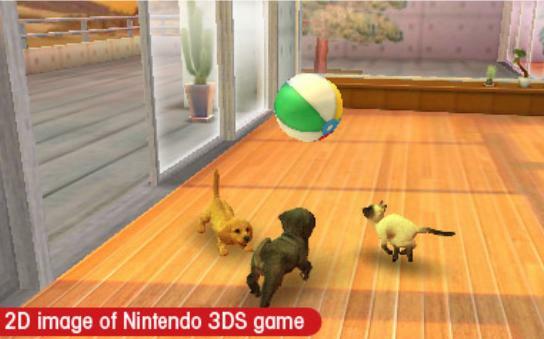 So why does 3D matter for a game like Nintendogs + Cats? In my experience, because it really brings the animals to life. The 3D makes the fur on the dogs and cats pop, and when they climb up on the screen with their little paws it's like they're climbing on you. 3D takes the flat, 2D animals of Nintendogs and turns them into something that, in my opinion, is more lifelike. Nintendogs is basically a game about looking at cute pets as you take care of them, so the more lifelike they look, the better. Nintendogs + Cats on the 3DS might not get the average gamer looking for Mario Kart or Legend of Zelda very excited, but it's definitely a big upgrade for Nintendo's pet simulator. 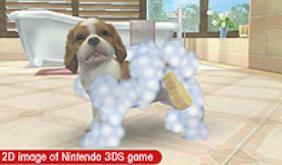 People went crazy over Nintendogs, and I don't expect that to change for the 3DS version. In fact, the frenzy might get even worse.